BriteSmile is the best investment you can make in yourself. Our revolutionary technology is clinically proven to get your teeth their whitest. Almost one million happy clients worldwide agree! Let’s face it: one of the first things you notice about people is their smile. When you meet someone with a bright, natural smile, it catches your attention. However, over time, the natural aging process and your lifestyle (smoking or drinking coffee, tea, or wine) can stain your teeth. BriteSmile whitening gel is carefully applied to your teeth. The gel is then activated by BriteSmile’s patented gentle blue light for 20 minutes while you relax and watch TV or listen to music. This process is repeated twice more before you go home with a naturally brilliant new smile (and your personal “Before & After” photos). Our single purpose is to achieve your healthiest and most naturally brilliant smile. 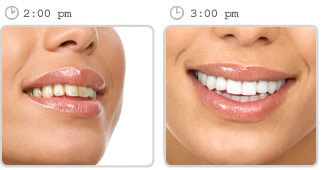 BriteSmile improves whiteness better than any other treatment available. In fact, we often see over fourteen shades of improvement. And the results last for years! The world is buzzing about BriteSmile’s teeth-whitening breakthrough! In top newspapers, magazines, and television broadcasts around the globe, BriteSmile is enjoying the limelight. We’ve even been featured in the prestigious gift basket for Academy Award winners and presenters.